Greece, a country seriously economically damaged by the Global Financial Crisis, has been forced into an early election after the Greek Parliament failed to elect a President. Under the Greek Constitution, the President is expected to win three-fifths of the vote in Parliament, or 180 votes, to be elected. If no candidate wins 180 votes in Parliament, an election is held. My previous post on Greece provides some background. The term of office of the incumbent Greek President, Karolos Papoulias, has recently expired, and the Greek Parliament must therefore elect a replacement. The table below shows the current balance of power in the Greek Parliament. The government consists of the New Democracy and Panhellenic Socialist (PASOK) parties. This coalition has 155 seats in the Greek Parliament. This is 25 votes short of the majority needed to elect a president. One candidate was nominated for the presidency: New Democracy member Stavros Dimas. At the first ballot, Dimas recieved 160 votes. This is the votes from the coalition, plus 5 independents. The remaining members either voted 'present' or abstained. At the second ballot, Dimas recieved 8 more votes, but was still short by 12. At this point, government members were furiously lobbying members of potentially friendly parties, like Democratic Left. However, the third ballot resulted in a failure by Dimas to recieve 180 votes. Three ballots are allowed before an election is called. Who will win an election? At present, the Radical Left Coalition (SYRIZA) is leading New Democracy in the polls by 4-6 points. Under Greece's electoral law, the party with the most votes wins a 50 seat bonus. This means that SYRIZA will be the largest party by a comfortable margin if these polls are correct. However, with undecided voters in polls included, they have a relatively low vote (below 30%), meaning that they may not win a majority, or even come close. Out of all the other parties, SYRIZA have few friends. New Democracy and PASOK think that they are too leftist and anti-establishment, they are hated by the far-right in Golden Dawn for being leftist, and the Communists hate them for some reason to do with ideology (it's complicated). As a result, there may be some effort by members of other parties to tactically vote for New Democracy to stop SYRIZA. This may also mean that even if SYRIZA are the largest party, they would be unable to form a government. It is worth pointing out that Golden Dawn's polling has recently dropped somewhat, and it has returned to the levels of the last election. The Independent Greeks vote has also dropped dramatically from the last election. Now, the New Democracy polling has stayed much the same from the last election. And there is no way of telling where the Golden Dawn and Independent Greeks vote is going (as far as I know). However, New Democracy's leader, Antonis Samaras, was very confident in nominating Dimas, a politically polarising figure, for the office of President. If he didn't want an election, it would be possible to nominate a consensus candidate with the support of the independents. Instead, he may have it all planned out. It still seems like an odd way to solve a governability crisis. After an election is held, a presidential candidate can be elected with a simple majority. This means that the government after the election will be able to chose the president. Golden Dawn appears to have peaked, and is unlikely to win more seats at this election. Independent Greeks will likely lose seats. PASOK will also probably lose seats, even if they do disguise themselves as the 'Olive Tree' like in the Euro-elections. Democratic Left will be wiped out. The River , a centrist liberal party formed by journalist Stavros Theodokrais, will gain seats, and may be useful in supporting a pro-Euro government. In short, this election is unlikely to improve Greece's political and economic stability. Any election will worry investors, and the possibility, however remote, of a SYRIZA victory will scare them even more. For those who found that depressing, here are some goats playing on metal sheeting. Have a happy new year, readers! Sweden has been a well-covered topic on this blog, and for those starting anew, here is my post on the 2014 election, and here is my post on the proposed 2015 election. Anyway, the proposed 2015 election has been called off, after a deal between the centre-left Social Democrat-Green coalition and the centre-right Moderate-Liberal-Centre-Christian Democrat alliance to pass a budget. In effect, it is a coalition agreement between the centre-left and centre-right. The centre-right, having more seats than the centre-left, will propose a budget. The centre-left will form government, and they will be permitted to change the budget somewhat. The centre-right will abstain on the budget. Both groups will have a common policy on pensions, military issues, and energy.This deal will last until 2022, remaining in force even after the next scheduled election in 2018. So, what does this mean for Sweden's future? The coalition will be able to control Parliament, but it will come at a price. The far-right Sweden Democrats will gain significantly in the polls after an event like this. People who voted for a centre-right party thinking that they would be helping to elect a centre-right government may feel betrayed by the deal, and may respond to the centre-right's behaviour by voting for the far-right. This idea is borne out by multiple cases. From 2005 to 2009, Germany was led by a grand coalition between Angela Merkel's Christian Democratic Union and the Social Democrats. Merkel became Chancellor, and the Social Democrats were perceived as sellouts. At the 2009 election, the Social Democrats lost 11% of the vote compared to 2005, with the Greens and Left parties gaining by about 3 points each. In Austria, the 2006 election was followed by a grand coalition between the centre-right Austrian People's Party and the Social Democrats. 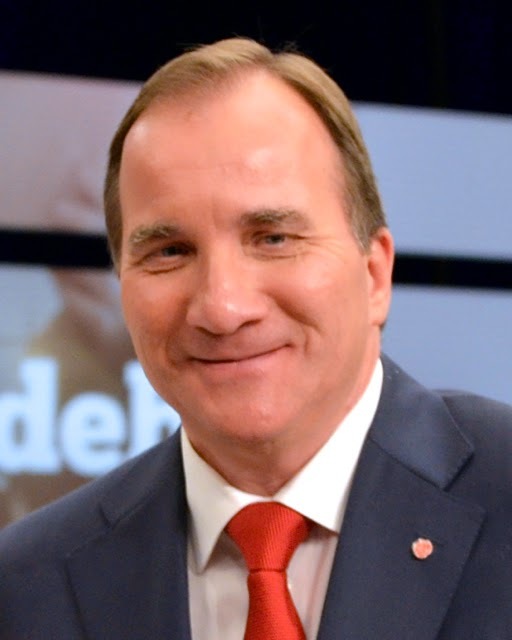 The Social Democrats got the prime ministership. When the Austrian People's Party pulled out of coalition, an election was called. At that election, both parties lost votes to the far-right, but the People's Party's losses were heavier. In short, it is probable that the 2018 Sweden election will result in losses for the centre-right and gains for the far-right. The current coalition will almost certainly control parliament from 2018 to 2022, but the tide of the Sweden Democrats will not be turned by this coalition, at least electorally. RESULT: Liberal Democrat-New Komeito coalition returned to power, with two-thirds majority. Well, it's all over, and the result has surprised no one. A comfortable win for Shinzo Abe, with 326 seats for his coalition in the House of Representatives. The result is a gain for the New Komeito-Liberal Democrat coalition of one on the current House and thirteen on the results of the last election. The Liberal Democrats recorded a big increase in their vote. Under Japan's mixed-member majoritarian electoral system, they won 33.1% of the proportional representation vote and 48.1% of the single-member district vote, up from 27% and 43% in 2012. A very good performance by Abe, given that his party has been in power for a year of relative stagnation. The party did not gain seats, but the consolidation of the opposition vote meant that they did not have the split of the vote between the opposition parties that helped them in 2012. The Democrats gained seats, in an entirely inevitable result. They won 73 seats in the 475 member House, a gain from the current House of 11 and from the last election of 16. This is a slight gain, but Democrats worried about a wipeout of their party can rest easy knowing that they appear to have a stable base of voters. The party won 18% of the proportional vote and 22.5% of the single-member district vote. The single-member district vote went down slightly from 23% in 2012, but the proportional vote went up from 15.5% in 2012. The Communist district vote went up, so perhaps leftist Democrats switched their district votes in safe Liberal Democrat seats. The Innovation Party did well. They won 41 seats, down one from the previous House. They won about 15.7% of the proportional vote and 8% of the single-member district vote. Some of this support probably came from Your Party, which was disbanded before the election. Innovation and the right-wing of Your have some common positions, and Innovation appears to have got the majority of the vote from the 2012 Restoration vote. New Komeito did well. I had expected them to lose seats as a backlash against militarist initiatives by the Abe government, but they gained 4 seats, and their vote went up slightly. They won all of the single-member seats that they contested off 1.5% of the single-member district vote, thanks to a non-competition agreement with the Liberal Democrats. The Communists had a good night. They won 21 seats, a gain of 13 from 2012. Attempts by the party to moderate its political stances and to shift away from doctrinaire Marxism appear to be working, and they managed to win a single-member seat for the first time since the introduction of the mixed-member majoritarian system in 1993. The party won 13% of the single-member district vote and 11.4% of the proportional vote. The Party for Future Generations did very poorly. The party attempted to trade off the personal popularity of 'spiritual leader' Shinataro Ishihara, but it flopped. They were unable to differentiate themselves from the much more popular Innovation Party, and lost most of their vote to them. They won 2 seats, 1.8% of the single member vote, and 2.65% of the proportional vote. The minor Social Democrats did poorly, winning 2 seats. However, with their 3 upper house members, they have exactly enough members to form a parliamentary party, giving them funding and status in the Japanese Parliament. Last, and almost certainly least, is Ichiro Ozawa's People's Life Party. This party, set up by former Democrat (and Liberal Democrat, and Liberal, and Japan New Party member, and New Frontier leader) was formed after poor results for the Tomorrow Party in the 2012 election. Ozawa was a key member of Tomorrow, and it has been speculated that his multiple scandals contributed to the downfall of the anti-nuclear Tomorrow Party. A lack of interest in the main issue for People's Life (nuclear power) and Ozawa's poor reputation meant that People's Life won 2 seats. So, where is Japan's political system headed? Well, the Democrats are unlikely to return to government any time soon, but the Democrats are unlikely to disappear, and they are going to be the main opposition to the Liberal Democrats. The Communists will be a problem for the Democrats, as they are required by party rules to contest every single-member constituency, which will split the left-wing vote. Unless something astonishing happens, the Liberal Democrats will rule Japan for a long time to come. Japan's snap election, which will take place in about 10 days, has already caused the premature end of one political party. Your Party, a right-wing libertarian party once considered to be a possible third force in Japanese politics, was dissolved by a vote of the party caucus on November 19. The party had been in disarray ever since half the caucus left to form the (you can't make this up) Unity Party. This party decided to merge into the Japan Innovation Party, itself a split from the nationalist Restoration Party. This month's NHK poll showed Your Party with 0% support. Given that 40% were supporters of 'no party', it seems unlikely that there is actually no support for Your Party, but given that they were at 3.7% after the 2012 election, it does show how poorly the party is regarded in the eyes of the public. 0% support rates in the NHK poll for certain parties are not an unusual phenomenon in Japan. The Green Wind party (sounds better in Japanese) managed a top percentage of 0.1% and 5 out of 7 polls in which the party were polled gave them 0%, while the New Renaissance Party managed to get 0% in all 7 polls in which they were included. The same poll had Ichiro Ozawa's People's Life Party on 0% and the Party for Future Generations (the Restoration members who didn't leave) on 0.2%. This election is not a referendum on Abenomics! The most common narrative about this election in the media is that it is a referendum on Shinzo Abe's economic plan. This is not acccurate. In a hypothetical referendum on Abenomics, there would be two options: yes or no. In this election, the Liberal Democrats are the yes option. There is, however, no coherent no option. There are many parties that claim to provide an alternative to Abenomics. While the Democrats are obviously the largest alternative, the Communists (the biggest issue for the Democrats) and the Japan Innovation Party are the other two parties likely to make an impact. The Liberal Democrats will be able to exploit this division. The Communist Party is bound by their constitution to run a candidate in each single-member district, which will split the anti-Abenomics vote. The Innovation Party do have the option of tactical nomination, but they will be unlikely to want to support a Democrat government. The small parties, like People's Life and Future Generations, will have no constructive role in this election other than one that distracts from the campaign of the large alternatives to Abenomics. To be totally honest, there is virtually no chance of a Liberal Democrat loss. The 2012 election has shown that even a small vote for the Liberal Democrats can give them a majority. The Democrats can make some inroads into the Liberal Democrat majority, but I do not think that there will be enough for them to win. Taiwan's largest ever local elections are scheduled to be held today, and, despite being a relatively minor election in terms of actual power over Taiwan, they are expected to be a useful barometer of public opinion in an island that has traditionally been a thorn in the side of the People's Republic of China. Taiwan is not really a 'country', as recognised by most of the world. As Taiwan lays claim to all of China, plus some bits of Mongolia and Central Asia, governments cannot diplomatically recognise 'Taiwan' as an independent country; they have to go for either recognising the People's Republic of China (the commies) as the government of all China (including Taiwan), or recognising Taiwan (the Republic of China) as the government of all China. Most countries go for the former, seeing that Taiwan is less economically powerful and that the People's Republic is no longer really 'communist'. Taiwan has the diplomatic allegiance of a few Pacific and Central American countries (international heavy hitters like Nauru, Palau and Panama), as well as the Vatican City, but most countries have a 'one China policy', although there are usually warm words for Taiwan's democracy from Europe and the United States. Taiwan was originally part of China, before being ceded to Japan in the dying days of the Empire. After World War 2, Japan handed Taiwan over to the Republican government who at that point controlled China. The civil war between the Republicans (Kuomintang) and the Communists broke out, and the Republicans were forced to retreat to Taiwan. The Republicans, led by noted egomaniac Chiang Kai-Shek (who had his portrait on Tiananmen Square before Mao) then proceeded to run Taiwan like a military barracks. The original National Assembly and Legislature elected after World War 2 were kept, and elections only took place to fill seats vacated by dying members of these assemblies. Only the three approved parties (Kuomintang, Chinese Youth Party, and Democratic Socialist) were permitted to contest these elections, although independents could also run. Advocating independence for Taiwan was punished by death, and most of Taiwan's small wealth was spent on military equipment, which was useless as Taiwan was too small to either defend attacks from the People's Republic or retake the mainland. Things were not much better under Chiang Chiang-Kuo, Kai-Shek's son, who took over in 1975. By this point, Taiwan had become an international pariah. Even the United States had cut off diplomatic relations with them, and they had relatively little international aid or military. China were too busy modernising to invade, but had they decided to, they would have squashed Taiwan like a bug. The economy was doing well, but Taiwan had become irrelevant. Ching-kuo, however, showed signs of softening in the late 1980s. He appointed a non-mainlander, Lee Teng-Hui, as Vice-President, removed martial law, and sent negotiators to the People's Republic over a hijacked aeroplane. When the pro-independence Democratic Progressive Party was formed, he decided not to prosecute it, despite the fact that political parties were technically banned. After Ching-kuo's death in 1988, he was replaced by Lee Teng-Hui, his vice-president. Lee immediately began a policy of democratisation, introducing direct elections for the National Assembly, Legislative Yuan, and the Presidency. The Republicans won all of these, with the Democratic Progressive vote hovering around 20%-30%. Teng-Hui moved the Republicans away from their reunificationist policy towards a pro-independence policy. This did not go down all too well with the Republicans. In 1996, the New Party, a right-wing Chinese reunificationist party. contested the Legislative Yuan elections, winning 13% of the vote and 21 seats in the 164 member Yuan. In that election, the Kuomintang won 85 seats and the Democratic Progressives won 54. The New Party collapsed pretty quickly, though, and fell to 11 seats in the 1998 elections (in an expanded Legislative Yuan of 225). The 2000 presidential election was far more controversial. Reunificationist Kuomintang candidate James Soong was the most popular candidate for the Kuomintang nomination, but Lee Teng-Hui, worried by Soong's radicalism, used his power within the party to nominate Lien Chan, Vice President and a moderate. A jilted Soong ran as an independent, and split the reunificationist vote, electing pro-independence Democratic Progressive nominee Chen Shui-Bian. Chen won only 39.3% of the vote, with Soong winning 36.8% and Chan winning 23.1%. After the election, Soong formed his own reunificationist party, called the People First party. Teng-Hui, a hated figure within the Kuomintang for his effective election of Shui-Bian, was expelled from the Kuomintang, and formed his own pro-independence party called the Taiwan Solidarity Union. In the 2001 legislative elections, the Democratic Progressives won 87 seats out of 225, beating the Kuomintang, who only won 68. People First won 46 seats and the Taiwan Solidarity Union won 13. The New Party won just 1 seat, while 10 independents were elected. While the reunificationists did have a majority, enough Kuomintang and People First legislators were convinced into supporting the Democratic Progressive-Taiwan Solidarity coalition. Shui-Bian's term was very controversial. In his inaugural speech, he had laid out his "Four Noes and One Without" policy, saying that if the People's Republic of China did not take military action against Taiwan, they would not change their name to "Republic of Taiwan", declare Taiwanese independence, promote a referendum on either unification or independence, or promote special relations with the People's Republic. However, during his first term he made many controversial statements that contradicted this above sentiment. He won the 2004 presidential election against a Chan-Soong Kuomintang ticket, but only narrowly, and only after a controversial shooting incident. In his second term, allegations of corruption made him deeply unpopular. His wife was arrested; he had presidential immunity from prosecution and could not be arrested. His approval rating went down to 8%, and the Democratic Progressive Party was solidly defeated in the 2008 election, losing to the Kuomintang's Ma Ying-Jeou. Chen was arrested, and sentenced to 21 years in prison for corruption. At present, the Ying-Jeou government is supportive of accelerating the pace of unification with China. Free trade agreements have been pushed through the Legislative Yuan, direct travel to the mainland became legal, and meetings have been conducted between Taiwanese and People's Republic leaders. This was broadly accepted during Ying-Jeou's first term, with support for the Kuomintang remainin g high. In 2012, Ying-Jeou was re-elected against Democratic Progressive chairwoman Tsai Ing-Wen and James Soong, winning 51.6% to Ing-Wen's 45.6% and Soong's 2.8%. However, Ying-Jeou's support has quickly ebbed away. His approval rating has dropped significantly since his re-election, and a number of controversies regarding relations with China have dramatically reduced his popularity. Student protest movements have brought attention to perceived corruption and improper ties to China, and Taiwan's economy is still stagnating. The Democratic Progressive Party are relatively strong, but Taiwan's polarised political system creates something of a cap on their support. No matter how unpopular Ying-Jeou and his party are, there is a body of voters who will vote for them against the Democratic Progressives no matter what. Taiwan's new electoral system will have something of an impact, as well. Taiwan used to use the single non-transferable vote system, but a change in 2005 to the mixed-member majoritarian system means that the Taiwanese Parliament is less proportional. This means that if the Democratic Progressives become the largest party in terms of the vote, as they were in 2001, they will likely win a majority in the Legislative Yuan, and have significant power. Originally, the People's Republic's plans for unification of China involved the treatment of Taiwan as any normal province. However, Deng Xiopeng's "one country, two systems" proposal, that involved giving Hong Kong and Macau 'managed democracy' and 'regional autonomy'. After Taiwan's democratisation, this proposal was held up by pro-unification Taiwan politicians as a model for Taiwan's reunification. However, events in Hong Kong may have changed this view somewhat. I have no opinion polling on this, but surely the People's Republic's refusal to allow democratic elections for Hong Kong would erode popular confidence in reunification. Reunification is already unpopular; Hong Kong's protests cannot do anything to make it less so. The result of the election were fairly decisive. The Democratic Progressive Party won 4 out of 6 mayoralties; a fifth, the capital of Taipei, went to a pro-independence Independent supported by the Democratic Progressives. The only Kuomintang mayor to hang on was Sean Lien of New Taipei, who won by a tiny margin. Most councils and other local offices were won by the Democratic Progressive Party. If the Kuomintang lose the presidential election, there is a good chance that they will also lose control of the legislature, as even a small win in the popular vote will probably give the Democratic Progressives a comfortable majority. There is still no consensus on Taiwan's political future. The Kuomintang are far away from any collapse, and they have the ability to come back, even if they lose a presidential election. Taiwan's two-party system, created by the mixed-member majoritarian system, appears to be working. The polarisation of Taiwan's political system is well in place, and any party that is not either green (pro-independence) or blue (pro-unification) has little chance of any political success. Japanese Prime Minister Shinzo Abe has recently announced that he will be dissolving the House of Representatives (the lower house of the Japanese Diet), and will be calling a general election for the 14th of December. The election only had to take place in 2016, and many questions have been asked about Abe's motives. Japan's Diet, or parliament, is bicameral. The two houses are the House of Representatives and the House of Councillors. Both houses are elected by a mixed-member majoritarian electoral system. The Prime Minister is elected by the lower house, but bills must be passed by both houses. Recent Japanese politics has been rather complicated, but there are effectively two parties. There is the Liberal Democratic Party, which is a centre-right party, and the Democratic Party, which is a centre to centre-left party. The Liberal Democratic Party is old. It was formed as a merger of the Liberal Party and the Democratic Party (That name must have taken ages to think up). They were formed in 1955, and were consistently in power from 1955 to 1993. The Democrats are much newer. For the first 30-40 years of the Liberal Democrats' dominance, they were opposed mostly by the Socialist Party, which never even came close to government. There were three other parties, too. The Buddhist Komeito party, the centre-left Democratic Socialists, and the far-left Japanese Communist Party. However, in 1993, it all changed. The Liberal Democrats split, with many members leaving and forming parties with somewhat more creative names. The Japan Renewal, Japan New, and New Party Harbinger were all formed by Liberal Democrat dissidents. In the election of that year, the Liberal Democrats won only 223 seats, with 256 seats needed for a majority. The opposition won the rest of the seats; however, the Communists refused to enter government. The Communists had only won 15 seats, however, meaning that an 8-party alliance could be formed with the support of the Independents. However, the government's hold on power was tenuous. The coalition only had 258 seats, a majority of just 2, It consisted of parties that could agree on little, other than the evil of the Liberal Democrats. Japan New Party Member of Parliament Morihiro Hosokawa, a former Liberal Democrat, was elected Prime Minister. This government passed electoral and political reform, but was simply too fractured to survive. Hosokawa resigned, and was replaced by another former Liberal Democrat, Tsutomo Hata. Hata's premiership was cut short by the withdrawal of New Sakigake and the Socialists, who promptly entered into a coalition with the Liberal Democrats. This coalition was disastrous for the Socialists, but it threw the now-opposition parties into disarray. The opposition parties formed two new parties; New Frontiers, and the Democrats. New Frontiers, which was led by promising young backroom hack Ichiro Ozawa, ended up with 156 seats, while the Democrats won 52. New Frontiers collapsed between 1996 and 2000, and Ozawa formed the Liberal Party to contest the 2000 election. The Liberals won 22 seats, and the Democrats won 129. The merger of the two parties created great hopes of a two-party system, a political system that had never been seen in Japan. Hopes of this were dropped after the 2005 election, which was called by Junichiro Kozumi over postal privatisation. The Liberal Democrats won 296 out of 480, while the Democrats won only 113. This election was perceived as a disaster for the Democrats, and it was used as proof that they were unable to form government. The Global Financial Crisis changed everything. After the popular Koizumi's resignation, Shinzo Abe ascended to the premiership. Abe's focus on textbooks and patriotic education was unpopular with an economy-focused electorate. Abe lost the 2007 upper house election to a resurgent Democratic Party, a loss which crippled the Liberal Democrats. Abe resigned as prime minister, and was replaced by a series of unpopular and ineffective leaders who failed to do much for the Liberal Democratic Party. The Democrats, led by Yukio Hatoyama won the 2009 lower house election, with 308 out of 480. The Liberal Democrats, led by Taro Aso, collapsed to just 114, while no other party won over 25 seats. Hatoyama became Prime Minister with a record majority. However, the Democrats' joy was short-lived. In 2010, Hatoyama resigned, following a scandal over an American naval base. He was replaced by Finance Minister and Deputy Prime Minister Naoto Kan. Kan was popular at first, but ruined his chances in the upper house election after announcing a hike in the sales tax from 5% to 10% before the election. (Little hint to politicians: announce unpopular policies after the election). The fractured nature of the Democratic Party caused serious problems for the party's stability. Ichiro Ozawa, upset at being forced to take the fall for a number of scandals, challenged Kan for the leadership. Kan comfortably beat Ozawa, but the damage was done. Following the 2011 earthquake, Naoto Kan resigned. Yoshikiko Noda replaced him, and inherited the difficult task of rebuilding both the country and the economy. Noda, despite shutting down power plants, was still supportive of nuclear power, and supported the sales tax increase. Here, Ozawa saw his opportunity. In 2012, he resigned from the Democrats, and formed the People's Life First party, an anti-sales tax rise, anti-nuclear party, taking 49 Democrat lawmakers with him. This cut into the Democratic majority, and the opposition introduced a vote of no-confidence in the lower house. Noda won the motion, thanks to the Liberal Democrats abstaining, but was massively weakened. Abe was elected leader of the Liberal Democrats, in preperation for the 16 December 2012 election. Noda's Democrats went to the election having won 308 seats at the last election, but only having 230 still in the party. Ozawa had teamed up with anti-nuclear governor Yukio Kada to create the Future Party, which held 61 seats. The Japan Restoration Party was formed by far-right Tokyo governor Shintaro Ishihara. The result of the election was disastrous for the Democrats. They only won 57 seats, while the Liberal Democrats won 294. The Restoration Party won 54, only just behind the Democrats, while Future crashed to just 9 seats. After the election, all but one Future members left to form People's Life (another tool of Ozawa's), and the party collapsed in May 2013. The Democrats elected former Industry Minister Banri Kaieda as leader. The Opposition still controlled the upper house, but this changed in 2013, when an upper house election gave the Liberal Democrats a comfortable majority, and gave the Democrats only 13.4% of the vote. The Liberal Democrats are currently fairly popular, but there are a number of political issues that can destroy a Japanese government, Abe is calling this election mostly to get a mandate for a sales tax increase, an issue that very much needs strong support from the electorate. A sales tax increase will take a long time to have a positive effect on the economy, and Abe needs the few extra years that an early election will give him. The election may also be somewhat of a housecleaning for the Diet. The right-libertarian Your Party, which won 18 seats at the election, has split, with 9 members leaving to form Unity (the most ironic name for a political party ever). The Restoration Party split, with Kyoto mayor Toru Hashimoto forming the Innovation Party (which was a merger with Unity) and Ishihara forming the Party for Future Generations. People First is also on life support, and will lose almost all of its seats. A clean parliament will be easier to manage for Abe. Given that Japanese opinion polling is utter nonsense, I will not attempt to predict seats shares. Rather, the table below demonstrates an approximation of how the parties will do. I won't write down justifications for all parties, as that would be overcomplicated, but any justification will be provided below in the comments. Personally, I think that the Liberal Democrats will be returned to office by a somewhat reduced majority. The Democrats, no matter how hapless their campaign is, will just have to gain seats, while the Communists will probably gain seats. Future Generations is too isolated and weak, while New Komeito (Buddhist) will lose seats, but will remain fairly strong. Parties with a focus on internet issues have become much more prominent recently. Like the wave of socialist parties in the 1910s, and the wave of green parties in the 1980s, internet parties have spread throughout the globe. However, so far most have met with little success. There are a few exceptions; the Icelandic Pirates have representation in the Althingi (Icelandic parliament), the Swedish Pirates won European Parliament seats, and the German Pirate Party has received some seats in state legislatures and in the European Parliament. The latter party is the subject of this post. After winning 9% of the vote and 15 out of 152 seats in the Berlin Parliament in 2011, the German Pirate Party shot to national prominence. The result put them above both the liberal Free Democratic Party and the far-right National Democratic Party, both parties with a long history in Germany. The Free Democratic Party had an especially bad time; they have been in the federal parliament since 1946. The Berlin elections were the last to be held in 2011, but the party managed to win seats in the state of Saarland in 2012, winning 4 out of 51 and 7.4% of the vote. They also won 20 seats out of 237 and 7.8% in North Rhine-Westphalia and 6 out of 69 and 8.2% in Schleswig-Holstein. By now. the media were treating the Pirates as a political party with an excellent chance of entering the Bundestag. The party were beginning to poll in the low teens. And while the temptation was to treat them as a joke, the traditionally close balancing of parties in the German Bundestag would mean that they would have to be taken very seriously by the German political establishment. The party was positioned to make a big splash in the German political system. The poor polling of the Free Democrats, a party with a somewhat similar political view, meant that they could attempt to attract other liberal-minded voters. With the Social Democratic Party moving further to the left and the Free Democrats becoming irrelevant, there was a space in the German political system, and the Pirates were poised to enter that space. However, just as the Pirates looked certain of entering the Bundestag (German federal parliament), the party began to lose support. It's hard to point to any single reason why they began to slide, but here are a few potential reasons. Voters not taking the Pirates seriously, especially liberal-minded voters who may have supported a party of that sort without the Pirate symbolism. Focusing on narrow issues that many voters do not care about, like online surveillance. As a result, the Pirates peformed poorly at the federal election. They only won 2.2% of the vote, which was below the 5% threshold required to enter the Bundestag. They fell further at the European Parliament election, winning only 1.45% of the vote in an election that is usually perceived as an opportunity to elect protest candidates. However, due to the abolition of the 3% threshold, the Pirates were able to elect 1 Member of the European Parliament out of 99. So, where is the German Pirate Party headed? Well, they have polled very, very badly in recent state elections. They have not managed to make any further impact, and while they may stick around in the Berlin parliament, they are unlikely to re-elect any other members of state parliaments. One may ask then, why has the Pirate experiment so far failed? New political movements have entered worldwide, and the internet is a huge change that surely should cause some change in personal voting habits. The simple fact is that voters have so far tended not to vote with the internet in mind. There are notable exceptions, but the internet may not end up creating a great political movement. Unlike the green movement, the Pirate candidates of 2014 do not have the issue of nuclear weapons to use for political purposes. The lack of diversification of the 1980s Greens was also aided by the economy not being a big political issue, while the Pirates' lack of an economic policy is poorly timed given that voters are viewing the economy as a big issue. Who knows, perhaps the Pirates will rise again. Perhaps, when the economic crisis is over, internet surveillance will hit the headlines once more, and the Pirates will suddenly become relevant. However, in times like these, the Pirate Party is unlikely to make a serious and long-term impact. Recently, the Russian Duma (parliament) approved a new, or rather old, electoral law. The law provides for a mixed-member majoritarian system, with half of the 450 seats being elected by single-member plurality, and half of the seats being elected by closed-list nationwide proportional representation with a 5% threshold. The system has not been widely discussed, but it has the potential to have a significant effect on Russia's political system. Russia currently uses regional closed party list proportional representation with a 7% national threshold. This system was introduced in 2005 on the initiative of President Vladimir Putin. It was designed to give United Russia control over the Duma, and to remove independents. As United Russia was comfortably over 50% of the vote, proportionality was not an issue. At the first election under party-list PR in 2007, the system had its desired effects. United Russia won 64% of the vote and 315 out of 450 seats. The far-left nationalist Communist Party of the Russian Federation (CPRF) won 11.6% of the vote and 57 seats. The far-right nationalist Liberal Democratic Party of Russia (LDPR) won 8.1% of the vote and 40 seats, while the pro-Putin (at that point) centre-left Fair Russia party won 7.7% of the seats and 38 seats. The Agrarian Party (left-wing socialist) won 2.3% of the vote and no seats, while the centre-left liberal Yabloko party won 1.6% and no seats. The result was excellent for Putin. There was no serious opposition to his government, with the CPRF and LDPR both being fringe parties and Fair Russia being controlled by the Kremlin. A bit of political posturing could give United Russia the Duma support of the LDPR, and some populist-left posturing could do the same for the CPRF. However, under the presidency of Putin acolyte Dmitry Medvedev, United Russia lost support. The 2011 election (an election widely considered to be unfair) was relatively bad for United Russia, despite alleged fraud. United Russia fell to 49.32% of the vote, which gave them 238 seats. They narrowly won a majority thanks to Yabloko (who had won 4%) falling below the threshold, which meant that United Russia won 52.8% of the effective vote, and a majority of the seats. All the opposition parties had a vote increase. The CPRF won 19.2% of the vote and 92 seats. Fair Russia won 13.2% and 64 seats, beating the LDPR, which won 11.7% and 56 seats. This created a headache for Putin. At this point, the CPRF and LDPR were anti-Putin, while Fair Russia were growing more independent. A minority for United Russia would doom Putin to at least five years of horse-trading to pass his agenda. In 2013, Putin decided to change the law. A new electoral law was introduced into the Duma, providing for 50% of seats to be elected by party-list proportional representation with a 5% threshold and 50% of seats elected by single-member plurality. This law passed the Duma with wide support, with only the CPRF voting against. It is hard to pick any particular motivation for this vote other than blind Putin-hate on the part of the CPRF or Putinophilia (is that a word?) on the part of Fair Russia and LDPR, or both. The mixed-member majoritarian system has been used before in Russia. It was used for the first democratic election in 1993, and was used for the 1995, 1999, and 2003 Duma elections. As a result, there is some historical evidence for any claims. For a start, more parties will be represented in the Duma. Yabloko's vote has probably been depressed by liberals tactically voting for other parties rather than wasting their vote on a party with no chance of getting 7%. 5% is much more reasonable, and it is probable that Yabloko will re-enter the Duma, with approximately 20 members. There is room for other parties as well, and a liberalisation of the party registration law (passed concurrently with the electoral system change) may mean a wider variety of other opposition voices are represented. On the other hand, it could well mean that the liberal vote would become split, meaning that few liberals make it into the Duma. It will be good for United Russia. The divided opposition will be easily defeated in the single-member electorates, and they will win enough party-list seats to comfortably control the Duma. A widely reported characteristic of this system is its tendency to elect independents. And, as an independent candidacy is currently impossible in Russia, it is certain that we will see more independent members of the Duma. However, the high numbers of independents will not be repeated under the first mixed-member majoritarian election. This is because Russia's party system has developed significantly. In 1993, independents won 48.7% of the district vote and 30 seats. This was due to the complete lack of any large political parties. A local independent could win a seat and beat a candidate of a large party based on name recognition. Even in 1995, political parties were still weak. The CPRF was the largest party in both the list and constituency contests, which could be put down to good organisation left over from the Soviet era. The LDPR was the second largest party, but was far stronger in the lists which could be attributed to the vote-pulling power of leader Vladimir Zhirnovsky. The Kremlin-backed Our Home is Russia party (one of the predecessors of United Russia) won 45 seats on the list, but only 10 constituencies. Yabloko was the only reasonably balanced party, with 31 list and 10 district. Independents won 77 seats, all in districts. Independents reached their zenith in 1999, when 105 were elected. This could be attributed to a poor result for the Communists, who lost some district seats despite their national party vote rising. The Unity party, which was endorsed by then-Prime Minister Putin, was strong in the list but weak in the districts, while the only other party to do well in the districts was left-nationalist party Fatherland-All Russia, which won 31 seats. Much changed in the period leading up to the 2003 election. United Russia was formed from a merger of Unity and Fatherland-All Russia, while the new Rodina party was formed (left-nationalist). United Russia had the full backing of the Kremlin, and won comfortably, with 223 seats. With only 3 seats short of a majority, Putin had control (more or less) of the Duma during the 2003-2007 term, thanks to friendly minor parties and independents. However, the need for firmer control, and the irritant of having to negotiate with pesky independents, meant that Putin switched to party-list PR. While history shows that independents have done well under mixed-member majoritarian, Russians are now more used to powerful political parties. The existence of an obvious 'party of power' will help guide the voting intentions of Russians towards party-nominated candidates. Still, independents could be something of a pain for Putin if they get the balance of power. Okay, let's say that you are a civil servant in the Central Electoral Comission, and you have been asked to design an electoral system for Russia designed to be the best for United Russia. My personal proposal would be to introduce a proportional representation system, but with a fixed 60% majority for the largest party. This would be the best of both worlds: full control over Duma members, and a guaranteed majority for United Russia, as none of the split opposition parties could win. You could even lower the threshold to 5%, and it would make no difference to the United Russia majority. The results of the Duma elections using this system are below. On the 29th of November, the Australian state of Victoria will be holding an election. All 88 seats in the Legislative Assembly (the lower house) and all 40 seats in the Legislative Council (the upper house) will be up for election. The Assembly is elected by instant runoff voting in single member constituencies, while the Council is elected by the the single transferable vote with party tickets in 5 member electorates. Victoria is a two-party system. There is the centre-right Liberal Party of Australia and the centre-left Australian Labor Party. There is also the centre-right National Party, which is based only in rural areas, and is usually in coalition with the Liberals. There are a number of minor parties which have held seats in the upper house; the Greens (left-wing environmentalists) and the Democratic Labour Party (economically left, socially conservative). Independents have also been elected to the Assembly. Victoria is currently governed by a coalition of the Liberal and National parties. This coalition holds a majority of 1 in the Legislative Council, but is in a minority in the Assembly. 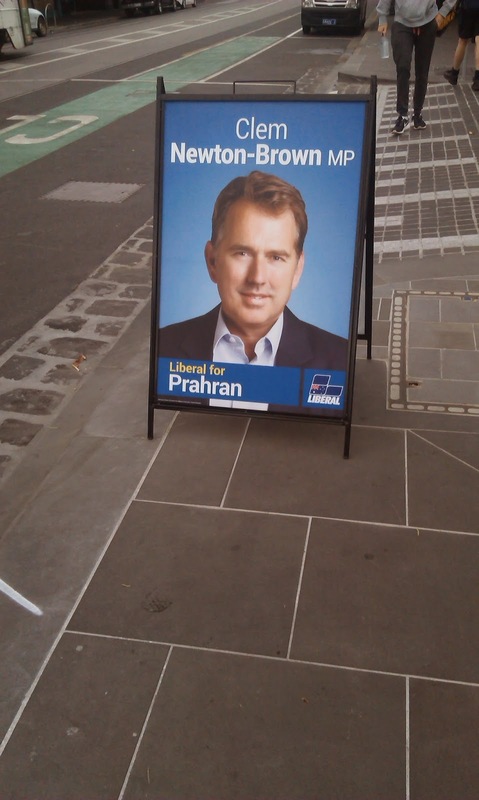 The Liberal/National coalition came to power in 2010, defeating the Labor government of Premier John Brumby. At that point the Liberals were led by Ted Bailleu, who became Premier. The Liberal/National coalition won a narrow majority, with 45 seats to Labor's 43. This meant that the government needed the vote of every MP (Member of Parliament, the lower house) in order to win a vote. This became important later. The government performed well in the polls directly after the election. However, the party's support soon fell, and the Liberal/Nationals hovered around 52% two-party preferred in the opinion polls by early 2012. The numbers in parliament became precarious after allegations of misconduct with public money were levelled against Geoff Shaw, the MP for Frankston. 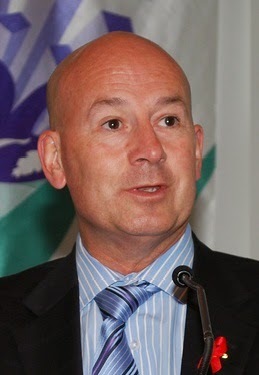 Shaw, whose conservative Christian views have caused controversy, and whose relationship with his ex-wife has caused more controversy, was placed into a very powerful position after the 2010 election. As the Liberal Party elected a speaker (Ken Smith) who cannot vote, the Liberals only had 44 votes to 43 for Labor. Shaw, or indeed any other Liberal or National MP, could theoretically cause the defeat of the government. On 6 March 2013, events finally came to a head. Shaw resigned from the Liberal Party and became an independent. The following day, Bailleu resigned as Premier. His place was taken by Denis Napthine. At this point, Shaw said that he would probably continue to support the government. The point was academic, as even with Shaw's support, a no-confidence motion could not pass. Labor technically had 43 MPs, but the resignation of one MP in a safe seat meant that the government was temporarily safe. Labor had problems of its own. They had not expected to be even close to victory in 2014, and as such had installed former Health Minister Daniel Andrews as leader. Andrews had virtually no public profile, and at the start of his term only 16% of voters thought that he would make a better premier. Even in 2012, his better premier support was low. While Shaw made lots of noises about toppling the Liberals, it was perfectly clear that he had no intention of handing government to Andrews. Given that Victoria has fixed four-year terms, a no-confidence motion against Napthine with no positive majority for Andrews would open a constitutional can of worms. Anyway, Shaw is virtually guaranteed to lose his seat, so it is not in his best interests to get a quick election. The East West Link is a proposed road project running from (as implied by the name) the western suburbs of Melbourne to the Eastern Freeway. The project was originally proposed by Liberal premier Jeff Kennett in 1999, but was brought to prominence when it was recommended by a commission into transport in Victoria in 2008. The Liberal/National coalition made it a policy in 2010, and preparations have been made for a contract in the last four years. However, this project has had some opposition. For a start, some believe that the plan is bad for the environment, as it will encourage more driving. These people believe that the government should prioritise public transport over road projects. A number of protests around the issue polarised public opinion between supporters and opponents of the plan. The issue has only heated up recently, especially since Daniel Andrews has promised to halt any plans if he is elected. A number of claims have been made to the effect that the election is a referendum on the road program. However, this is unlikely. If you look at the most marginal seats in the state, most of them are in the outer suburbs. These places are generally away from the areas directly affected by the link. The seats that will be directly affected are all irrelevant, as they are mostly safe Labor. The East West Link is something of a sideshow, and any local backlash can only increase Labor margins. Since the 1980s, this has always been an issue in Victorian elections. The public transport system in Victoria has been run by private companies since the privatisation by Jeff Kennett. There have been multiple controversies about how public transport has been run, and what sort of developments should be prioritised. The Liberal/National coalition have a policy of prioritising two projects: removing level crossings, and building a rail line to Melbourne Airport. The Labor Party plans to remove level crossings, extend a number of railway lines, and purchase 30 more trains. The Liberal/National coalition government has been criticised as a 'do-nothing' government that has not done much with four years of control of both houses of Parliament. This is somewhat true; although the government has been somewhat hijacked by Geoff Shaw's antics. Napthine has been criticised as a bland leader, and most state Ministers are relatively unknown. The Liberal/Nationals are also in government at a federal level, and state governments tend to do poorly when their federal counterparts are in government. 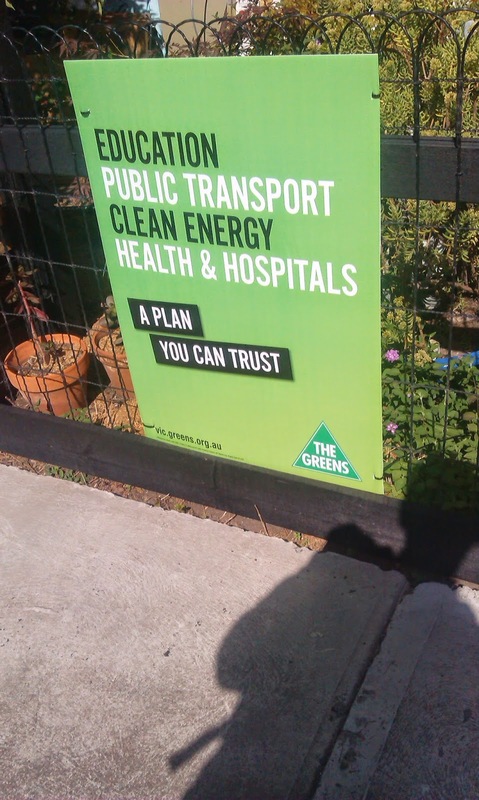 The Greens are unlikely to make any large gains. Leader Greg Barber is virtually unknown, and they will not be able to trade off personalities of candidates. They will hold their ground in the upper house, and may win a seat or two in the lower house, but they will not make a breakthrough. The other parties are small, but large in number. There are 21 parties registered to contest the election: excluding the above-mentioned 4, this effectively means that there are 17 small parties contesting, none of which is likely to make a significant impact. However, if the small parties stick together, and give each other preferences, it is possible that a number of minor candidates could be elected, even with small shares of the primary vote. In a finely balanced upper house, the votes of these members could be decisive. ABC election analyst Antony Green has more here. Kevin Bonham has done some useful analysis and modelling on his blog. The ABC's election guide is a useful resource for data. The Age newspaper has excellent coverage of the issues and events in the campaign. There are a number of electoral systems that do not comfortably fit into either the proportional or majoritarian classes. This post is intended to tie up these loose ends, and fully explain any unexplained systems. The Limited Vote is a relatively simple electoral system. It is similar to the multiple non-transferable vote, except voters have less votes than the number of seats to be filled. The number of votes is not fixed, but there must be more than one and less than the number of seats to be filled. The candidates with the most votes are elected. This system is used for the Spanish Senate election. The Single Non-Transferable Vote is similar, except voters have only one vote, and multiple seats are to be elected. The highest polling candidates are elected. Under mixed-member proportional, voters usually have two votes; one for a political party and one for a local candidate. The nation or region is divided into a number of single-member constituencies, but this number is less than the number of members to be elected to the legislature. In the local constituencies, the candidate with the most votes wins. With the party vote, all the votes are counted up nationwide and the seats in parliament are distributed proportionally (see previous post) amongst all the parties. These seats are first filled by elected candidates from constituencies. If further seats are to be filled, these are filled from a party list. This system is used in Germany and New Zealand. Under mixed-member majoritarian, voters usually have two votes; one for a political party, and one for a local candidate. Usually, the local candidate with the most votes is elected. The party votes are all counted up, and a specified amount of seats in the legislature are distributed amongst parties depending on these votes. This system is used in Japan and South Korea. These systems should really belong in the majoritatian section. But, for the sake of simplicity, I will put it here. Under a majority bonus system, voters vote for a party, and possibly for one or more candidates. Under one method, the party with the most votes automatically wins a percentage of seats ,usually above 50%, while the other seats are proportionally distributed amongst the parties. Another method uses normal proportional representation, but the largest party wins a set amount of seats on top of their proportional share. These systems are used in Greece and Italy. The second main type of electoral system is proportional systems. Proportional representation systems are designed to provide a close match between votes cast and seats won. Proportional representation systems are only used for legislatures, as a single office cannot be divided proportionally. There are two types of proportional representation. There are party list systems, which work by dividing seats between parties based on their vote shares and then electing members from lists of candidates, and the single transferable vote. The single transferable vote is slightly harder to explain, but it will be explained below. There are two basic elements to party list systems. The first is what sort of system is used to divide seats between lists (the method of seat apportionment) , and the second is how the party lists are composed. Largest remainder methods are one of two ways of distributing seats to parties. Under largest remainder methods, voters vote for a party list. The first step in seat allocation is to calculate a quota. There are a number of quotas. The Hare quota, invented by Thomas Hare, is total votes/seats. The Droop quota, invented by Henry Droop, is total votes/(seats+1) or total votes/(seats+1)+1. The Imperiali quota is total votes/(seats+2), and a quota used for Italian elections during the 1950s is total votes/(seats+3). The votes for each party are divided by this quota. A party receives one seat for each filled quota. If there are still unfilled seats, the party with the highest remainder is given one seat. This process continues, with no party being allocated more than one seat by highest remainders. The table below shows how the system works. In the election below, 5 seats are at stake, and 4 parties are competing. As you can see, three seats are allocated on full quotas: one each to parties A, B, and C. This leaves 2 seats unallocated. These are filled by parties A and B, as they have the 2 highest remainders. This system can be modified to only allocate seats on full quotas. Under this system, known as the remainder-transfer system, seats are allocated to parties for each quota that they win. Unused votes are transferred to a higher tier multi-member constituency, where all seats are allocated using quotas and largest remainders. The highest averages method is somewhat different. However, voters still cast votes for a party. These votes are tallied up. Under highest averages, a numerical sequence is decided on before the election. There are a number of different numerical sequences. There is the D'Hondt method, invented by Belgian mathematician Victor D'Hondt. This sequence starts at 1 and increased by 1 at each increase; it goes 1,2,3,4 and so on. The second system is the Sainte-Lague method. Invented by a French mathematician, this sequence consists of all positive odd numbers, starting at 1: it goes 1, 3, 5, 7 and so on. This system can be modified to increase the barrier for a first seat by changing the first divisor to 1.4. There is the Imperiali method, which starts at 2, goes up by 1 each time. There is also the Danish method, which goes 1,4,7,9 and so on. So, how do these systems translate votes to seats? Well, at the start, all votes are divided by the first number in the sequence. The party with the highest number is then awarded one seat, and their vote is divided by the next number in the sequence. At this point, the party with the highest vote wins a seat, and has their vote divided by the next number. This process repeats until all seats are filled. The table below shows a sample election, the same sample election as above. The D'Hondt method is used. As you can see, Party A has the highest vote, and it receives the first seat. Party A's vote is divided by 2 (the next number in the D'Hondt sequence). Because of this division, Party B wins the next seat. Party B's vote is then divided by 2 as well. Party C then wins a seat, and has their vote divided by 2. At this point. Party A has the highest vote, and they win another seat. Their vote is then divided by 3 (the next number in the sequence). This division makes Party B the largest, and they win the fifth and final seat. In order to fill these seats, parties need to create ranked lists of candidates. There are different ways of creating these lists. Under a closed list system, parties draw up a ranked list before an election. Voters vote only for a party, and the candidates on the list are elected in list order. Under a flexible list system, voters may vote for a candidate within a party. This vote counts as a vote for the party. If the vote for a candidate excludes a certain threshold, that candidate is elected. After all candidates with a personal vote over the threshold are elected, remaining seats are filled in party list order. This system is used in Sweden and the Netherlands. Under a free list system, voters have as many votes as there are candidates to be elected. Voters may cast multiple votes for a single candidate, or cast votes for candidates of different parties. Each vote for a candidate counts as a vote for the party that they are running with. Within parties, seats are filled by the candidates with the most votes. This system is used in Switzerland and Luxembourg. The Single Transferable Vote (STV) is one of the rarer voting systems. It is used only in Australia (for upper house elections in New South Wales, Victoria, South and Western Australia, for lower house elections in Tasmania and the Australian Capital Territory, and for the Federal Senate), Ireland (for all elections), Scotland (for local elections), India (for indirect federal upper house elections), and Malta (for all elections). Under the Single Transferable Vote, voters vote for candidates, not parties. Voters vote by numbering boxes next to candidates: a voter's most preferred candidate gets a 1, second most preferred a 2, and so on. At the start of the count, all number 1 votes are counted, and votes are tallied for each candidate. Following this, a quota is calculated. Under the first STV elections, the quota was the Hare quota (votes/seats), but this was abandoned, as this quota tends to increase the value of tactical voting (don't ask). Usually this quota is the Droop quota (votes/(seats+1)+1). Any candidate with more than the quota, or the same number of votes as the quota, is elected. If a candidate has the same number of votes as the quota, they are elected, and nothing needs to be done. However, if a candidate has more votes than the quota, then they have a surplus. Different STV methods differ on how to deal with this surplus; the Tasmanian STV system gives each surplus vote a value (number of surplus votes/total votes for elected candidate with further preferences), and distributes the votes at that value, while other systems take a random sample of surplus votes. Under most STV systems in use, all ballot papers are now treated as if that candidate never stood for election. If no candidate has a surplus, the lowest polling candidate is excluded. Their ballot papers are examined for further preferences: ballot papers are transferred to the next available preferences. If there are no further preferences on a ballot paper, that paper is marked 'exhausted', and is ignored for the remainder of the count. Again, all ballot papers are now treated as if the excluded candidate had never stood for election. This process repeats until all seats are filled. If, at the final stage, the number of candidates still in the count is equal to the number of seats unfilled, those candidates are elected, even if they have not reached the quota. Formerly for the Australian senate and for the Victorian, Western Australian, and South Australian upper houses, a modification is added. Parties have the option of lodging 'party voting tickets'. A party voting ticket is a list of candidates in an election ranked by a party. Under group ticket elections, voters either number every box for every candidate (only five in Victoria), or vote for a party ticket. Party tickets have been controversial for taking preference power out of the hands of the voters; this has resulted in anomalous results, like Ricky Muir getting elected to 1 of 6 Victorian Senate seats with 0.5% of the vote. In 2016, the Turnbull Liberal government made changes to the electoral law for the Senate. Group voting tickets were abolished. 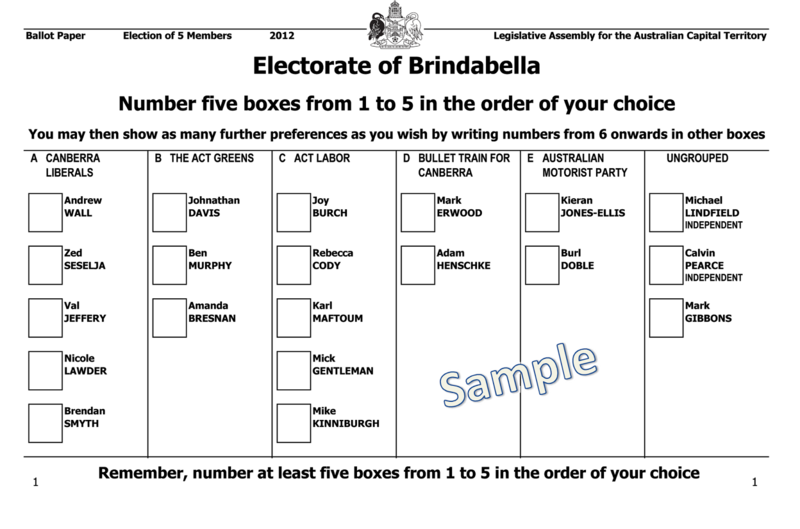 Ballot papers look the same, with voters having the option to vote for a parties above the line or individual candidates below the line. However, an above-the-line vote for a party has ceased to become an acceptance of a group voting ticket; it counts as a vote for the party's candidates in order of preference. For example, a person voting 1 above the line for the Labor Party (3 candidates) and 2 for the Greens (2 candidates) would have their vote go 1 to the first Labor candidate, 2 to the second, 3 to the third, then fourth to the first Green candidate, and fifth to the second. 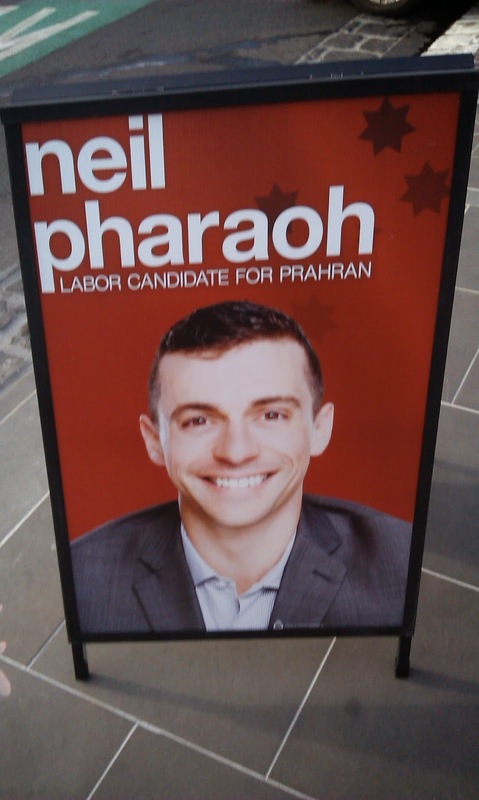 Onc but it would only go to Labor candidates. Voters can number multiple boxes above the line, and are told by the AEC to number six (though one is formal) but a vote exhausts when there is no remaining preference.